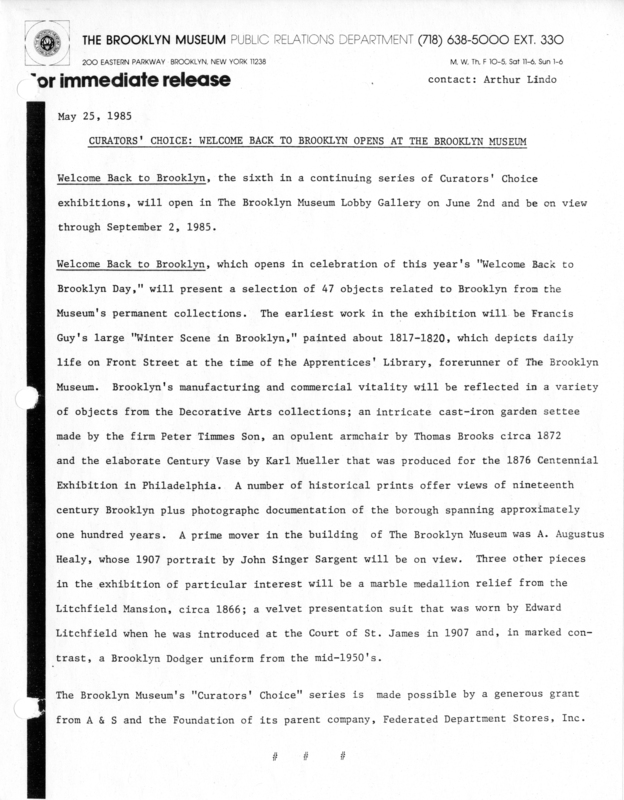 May 25, 1985 Welcome Back to Brooklyn, the sixth in a continuing series of Curators’ Choice exhibitions, will open in The Brooklyn Museum Lobby Gallery on June 2nd and be on view through September 2, 1985. 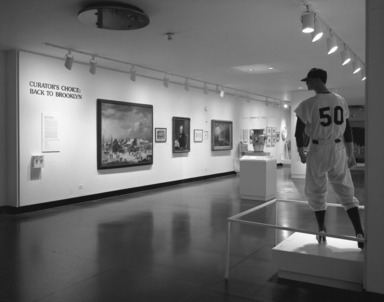 Welcome Back to Brooklyn, which opens in celebration of this year’s “Welcome Back to Brooklyn Day,” will present a selection of 47 objects related to Brooklyn from the Museum’s permanent collections. The earliest work in the exhibition will be Francis Guy’s large “Winter Scene in Brooklyn,” painted about 1817-1820, which depicts daily life on Front Street at the time of The Apprentices’ Library, forerunner of The Brooklyn Museum. Brooklyn’s manufacturing and commercial vitality will be reflected in a variety of objects from the Decorative Arts collections; an intricate cast-iron garden settee made by the firm Peter Timmes Son, an opulent armchair by Thomas Brooks circa 1872 and the elaborate Century Vase by Karl Mueller that was produced for the 1876 Centennial Exhibition in Philadelphia. 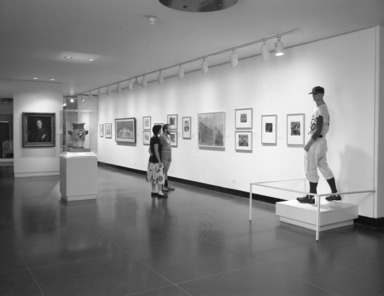 A number of historical prints offer views of nineteenth century Brooklyn plus photographc documentation of the borough spanning approximately one hundred years. A prime mover in the building of The Brooklyn Museum was A. Augustus Healy, whose 1907 portrait by John Singer Sargent will be on view. 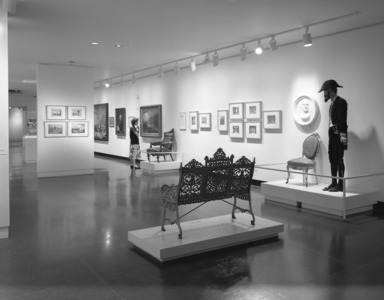 Three other pieces in the exhibition of particular interest will be a marble medallion relief from the Litchfield Mansion, circa 1866; a velvet presentation suit that was worn by Edward Litchfield when he was introduced at the Court of St. James in 1907 and, in marked contrast, a Brooklyn Dodger uniform from the mid-1950’s. 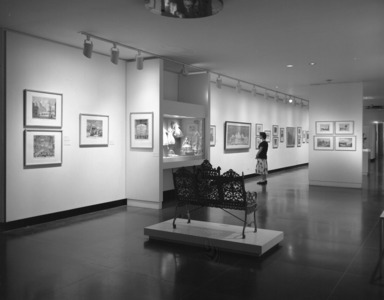 The Brooklyn Museum’s “Curators’ Choice” series is made possible by a generous grant from A & S and the Foundation of its parent company, Federated Department Stores, Inc.
Brooklyn Museum Archives. Records of the Department of Public Information. Press releases, 1971 - 1988. 1985, 027.